La Rocca P. et al. 2016. The EEE Project: a sparse array of telescopes for the measurement of cosmic ray muons. https://iopscience.iop.org/article/10.1088/1748-0221/11/12/C12056/pdf. Massam T., Miller T. and Zichichi A. 1963. A telescope to identify electrons in the presence of pion background. Nuclear Physics Division, CERN 63–25. https://www.worldscientific.com/doi/pdf/10.1142/9789812795724_bmatter. Sauli F. 2014. Gaseous Radiation Detectors. Cambridge University Press, Cambridge. https://doi.org/10.1017/CBO9781107337701. Wiik B., Wagner A., and Wenninger H. (eds.) 2002. From the Pre-shower to the New Technologies for Supercolliders – In Honour of Professor Antonino Zichichi. World Scientific Series in 20th Century Physics, Vol. 31, World Scientific Publishing, Singapore. https://doi.org/10.1142/5132. Wolf G. 1987. HERA: physics, machine and experiments. in Techniques and Concepts of High Energy Physics IV, NATO ASI Series (Series B: Physics), Vol. 164, edited by Ferbel T., et al., Springer, NY, pp. 375–449. https://doi.org/10.1007/978-1-4684-5401-7_6. Zichichi A. (ed.) 1979. LEP WorkingGroup Progress Report. European Committee for Future Accelerators. ECFA /79/39. https://cds.cern.ch/record/124218/files/CM-P00100391-e.pdf. Zichichi A. 1988a. The Eloisatron project: Eurasiatic long intersecting storage accelerator. 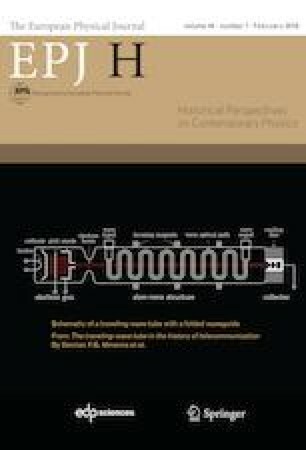 In Proceedings of the 4th INFN Eloisatron Project Workshop on New Aspects of High-Energy Proton-Proton Collisions, Ettore Majorana International Science Series, edited by A. Ali, Plenum Press, New York. https://doi.org/10.1007/978-1-4615-9540-3. Zichichi A. 2006. Closing lecture. In Proceedings of the 44th International School of Subnuclear Physics, Erice. www.ccsem.infn.it/issp2006/.